You’re probably more likely to recognise the name Raymond Briggs as the author of The Snowman, since the cartoon adaptation, along with the song Walking in the Air, sung by then choirboy Aled Jones, have made this particular book particularly famous. 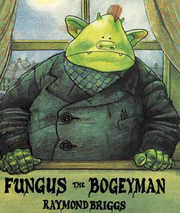 Â In complete contrast to this much sweeter story, I’ve decided to write today about one of Mr. Briggs earlier works, Fungus the Bogeyman. The book charts a day (or should I say night) in the life of the titular Fungus, a Bogeyman whose job it is to scare us human beings witless. Â Fungus wakes up in his underground home and gets ready to go to work, and along the way we learn all about the disgusting traits and habits of the Bogeymen, who like dirt and grime in the same way we prefer cleanliness, especially when it comes to food! Fungus starts his night of work, but finds himself going through a bit of an identity crisis. Â As he carries out his work of scaring people and giving them boils he wonders what life is all about, and what this job of his is really for, much like the rest of us have probably done at some point or other in their life. The book, as with all Raymond Briggs childrens books, is beautifully illustrated in that soft, rounded style which is all Briggs own. Â Throughout the story we are treated to some gory and gruesome sights, and learn a lot about Bogeyman culture, and how it mirrors our own. Â The tale is presented in the form of a comic strip, but most of the panels of the story are full of little jokes and gags beyond that required to tell us about Fungus’ adventures. Fungus is a great book for parents to read to their children as they will get just as much joy from it as their kids. Â Whilst the young ‘uns will enjoy all the frights and horrible tricks that Fungus gets up to, adults will see another layer of wit on top of this in the way Fungus’ job and world is perhaps not quite so different to our own as it first appears. The original Fungus the Bogeyman book was published in 1977, but in 1982 we saw the release of the Fungus the Bogeyman Plop Up Book, which was a beautifully constructed pop up book, with some wonderful and highly complex pop up pages contained within. Â I must say I do love pop up books, they are something you really don’t seem to see that much these days, and certainly not of the quality of the Fungus book anyway. Surprisingly, it took more than twenty years for Fungus to make it to television, with the BBC doing a short serialised story based on the book that aired in 2004. Â This was a combination of live action humans and Bogeymen that were created on computer. Â Strangely enough, the television version wasn’t a massive hit, but it is now available on DVD if you missed it and are curious. Â The story was also adapted for the stage, which played at the artsdepot in North London over the Christmas period of 2007. This entry is filed under Books and Magazines	and was posted on February 23rd, 2009. You can follow any responses to this entry through the RSS 2.0 feed. You can leave a response, or trackback from your own site.